Emma Stone is an American actress who aspired to an acting career from an early age. She had her first role onstage at age 11, and followed with parts in sixteen plays in a regional theater in Arizona. Stone made her television debut in the unsold pilot for the reality show The New Partridge Family (2005). After brief television roles in Medium, Malcolm in the Middle, and Lucky Louie, she made her film debut in the comedy Superbad (2007). Stone appeared as a ghost in Ghosts of Girlfriends Past (2009), and found commercial success with the horror comedy Zombieland, where she played a zombie apocalypse survivor. Her breakthrough came with her first leading role (a high school student perceived to be sexually promiscuous) in the teen comedy Easy A (2010). She subsequently earned nominations for a BAFTA Rising Star Award and a Golden Globe Award for Best Actress. In 2011, she starred in the romantic comedy Crazy, Stupid, Love and in the period drama The Help, which were both commercial successes. 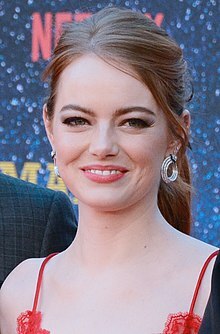 Stone's success continued with her portrayal of Gwen Stacy in the 2012 super-hero film The Amazing Spider-Man that became her highest-grossing release, with a worldwide revenue of $757 million, and she later reprised the role in its 2014 sequel. Critical success followed with the role of a recovering drug addict in the black comedy-drama Birdman or (The Unexpected Virtue of Ignorance) (2014). It earned her a nomination for the Academy Award for Best Supporting Actress. Later that year, she made her Broadway debut in a revival of the musical Cabaret (2014–2015). Stone won the Academy Award for Best Actress for playing an aspiring actress in the musical La La Land (2016). It is her highest rated film on the review aggregator site Rotten Tomatoes. Stone also recorded six songs such as "City of Stars" for the film's soundtrack. She went on to star and serve as an executive producer in the Netflix black comedy miniseries Maniac (2018), and gained another Oscar nomination for portraying Abigail Masham in the historical comedy-drama The Favourite (2018). ^ Movie 43 is a comedy film featuring fourteen different stories, each by different directors: Steven Brill, Peter Farrelly, Will Graham, Steve Carr, Griffin Dunne, James Duffy, Jonathan van Tulleken, Elizabeth Banks, Patrik Forsberg, Brett Ratner, Rusty Cundieff, James Gunn, and Bob Odenkirk. ^ a b "Emma Stone Biography". People. Archived from the original on April 19, 2016. Retrieved September 8, 2013. ^ "Emma Stone: Before She Was Famous". The Huffington Post. January 4, 2012. Archived from the original on March 22, 2016. Retrieved July 30, 2016. ^ a b "Emma Stone Biography". FYI. Archived from the original on April 23, 2016. Retrieved July 30, 2016. ^ Grossberg, Josh (June 7, 2013). "Emma Stone Flashback: See Star Sing on Partridge Family Reality Competition in Pre-Fame Days". E!. Archived from the original on May 8, 2016. Retrieved July 30, 2016. ^ "Emma Stone, une muse qui ne craint pas les défis". L'Express (in French). October 14, 2015. Archived from the original on October 19, 2015. Retrieved March 23, 2016. ^ "Zombieland (2009)". Box Office Mojo. Archived from the original on March 30, 2010. Retrieved March 26, 2016. ^ "Emma Stone On 'Obsessing' Over Her Breakout Role In 'Easy A'". Access Hollywood. August 31, 2010. Archived from the original on April 9, 2016. Retrieved August 1, 2016. ^ "Nominees Are Announced Orange Wednesdays Rising Star Award". British Academy of Film and Television Arts. January 6, 2011. Archived from the original on January 10, 2011. Retrieved August 1, 2016. Kaufmann, Amy (December 15, 2010). "Golden Globes 2011 nominations: Newcomers Emma Stone, Jennifer Lawrence, and Mila Kunis react". Los Angeles Times. Archived from the original on December 18, 2010. Retrieved December 19, 2010. ^ "Crazy, Stupid, Love. (2011)". Box Office Mojo. Archived from the original on April 17, 2016. Retrieved January 17, 2017. ^ "The Help (2011)". Box Office Mojo. Archived from the original on January 11, 2017. Retrieved January 17, 2017. ^ "Emma Stone". Box Office Mojo. Archived from the original on August 27, 2016. Retrieved August 1, 2016. ^ "The 87th Academy Awards (2015) Nominees and Winners". Academy of Motion Picture Arts and Sciences. Archived from the original on December 1, 2015. Retrieved August 1, 2016. ^ "Oscar winners 2017: the full list updated live". The Guardian. February 26, 2017. Archived from the original on February 27, 2017. Retrieved February 27, 2017. ^ "Emma Stone". Rotten Tomatoes. Archived from the original on September 10, 2016. Retrieved January 16, 2017. ^ Mangan, Lucy (September 21, 2018). "Maniac review – Jonah Hill and Emma Stone hit career highs in NYC dystopia". The Guardian. Archived from the original on September 21, 2018. Retrieved September 21, 2018. ^ "Oscars: Nominations List". The Hollywood Reporter. January 22, 2019. Archived from the original on January 22, 2019. Retrieved January 22, 2019. ^ "Emma Stone". British Film Institute. Archived from the original on June 5, 2016. Retrieved April 15, 2016. ^ Farber, Stephen (August 6, 2007). "Superbad". The Hollywood Reporter. Archived from the original on April 8, 2016. Retrieved July 30, 2016. ^ "The Rocker". Rotten Tomatoes. Archived from the original on March 12, 2016. Retrieved March 24, 2016. ^ Fox, Ken. "The House Bunny". TV Guide. Archived from the original on April 7, 2016. Retrieved July 30, 2016. ^ "The Ghosts of Girlfriends Past". Rotten Tomatoes. Archived from the original on June 10, 2016. Retrieved July 30, 2016. ^ Lawrence, Will (April 18, 2014). "The heart of Stone". Irish Independent. Archived from the original on June 10, 2016. Retrieved July 30, 2016. ^ Robey, Tim (October 8, 2009). "Zombieland, review". The Daily Telegraph. Archived from the original on April 24, 2016. Retrieved July 30, 2016. ^ Kit, Borys (November 3, 2009). "Owen Wilson signs on for 'Marmaduke'". Reuters. Archived from the original on March 5, 2016. Retrieved July 30, 2016. ^ Smith, Anna (October 19, 2010). "Easy A". Time Out. Archived from the original on April 13, 2016. Retrieved July 30, 2016. ^ Siegel, Tatiana (July 13, 2010). "A-Rod goes from big leagues to bigscreen". Variety. Archived from the original on October 4, 2013. Retrieved July 30, 2016. ^ McWeeny, Drew (July 21, 2011). "Review: Ryan Gosling, Emma Stone, and Steve Carell excel in smart, adult 'Crazy, Stupid, Love'". HitFix. Archived from the original on April 6, 2016. Retrieved July 30, 2016. ^ Smith, Anna (October 26, 2011). "The Help Review". Empire. Archived from the original on September 18, 2016. Retrieved July 30, 2016. ^ Lacker, Chris (July 24, 2011). "Interview: Emma Stone Plays Spider-Man's First Love". The Vancouver Sun. Archived from the original on August 5, 2016. Retrieved July 30, 2016. ^ Sneider, Jeff; Kroll, Justin (July 26, 2011). "Emma Stone rounds up 'Gangster Squad'". Variety. Archived from the original on July 31, 2013. Retrieved July 30, 2016. ^ Skinner, M. Scot (November 4, 2010). "After 'Hours', a Q & A with star". Arizona Daily Star. Archived from the original on March 7, 2016. Retrieved July 30, 2016. ^ Minow, Nell (March 20, 2013). "The Croods". Chicago Sun-Times. Archived from the original on July 25, 2016. Retrieved July 30, 2016. ^ "Emma Stone talks saving Spidey in The Amazing Spider-Man 2". Total Film. January 4, 2014. Archived from the original on July 1, 2014. Retrieved April 6, 2016. ^ Scott, A. O. (July 24, 2014). "Metaphysical Sleight of Heart". The New York Times. Archived from the original on July 15, 2016. Retrieved July 30, 2016. ^ Brian, Greg (November 13, 2014). "Was 2014 the Most Significant Breakthrough Year for Emma Stone? Oscar Chances for 'Birdman'". The Movie Network. Archived from the original on 2016-04-07. Retrieved July 30, 2016. ^ "Aloha". Rotten Tomatoes. Archived from the original on May 17, 2016. Retrieved July 30, 2016. ^ "Irrational Man". Rotten Tomatoes. Archived from the original on May 10, 2016. Retrieved July 30, 2016. ^ a b Ceron, Ella (June 3, 2016). "Emma Stone Just Dropped a New Song With Your Favorite Popstar". Teen Vogue. Archived from the original on August 11, 2016. Retrieved July 30, 2016. ^ Coggan, Devan (March 7, 2016). "Ryan Gosling, Emma Stone musical La La Land pushed to December". Entertainment Weekly. Archived from the original on April 7, 2016. Retrieved July 30, 2016. ^ Nolfi, Joey (April 13, 2016). "'Battle of the Sexes': See Emma Stone and Steve Carell as Billie Jean King and Bobby Riggs". Entertainment Weekly. Archived from the original on January 4, 2017. Retrieved January 17, 2017. ^ Jafaar, Ali (September 24, 2015). "Emma Stone & Olivia Colman In Talks To Board Yorgos Lanthimos' 'The Favourite'". Deadline Hollywood. Archived from the original on April 17, 2017. Retrieved March 23, 2017. ^ Matt Joseph (January 21, 2019). "First Zombieland: Double Tap Plot Details Tease New Zombies And More". We Got This Covered. Archived from the original on January 24, 2019. Retrieved January 21, 2019. ^ Grossberg, Josh (June 7, 2013). "Emma Stone Flashback: See Star Sing on Partridge Family Reality Competition in Pre-Fame Days". E!. Archived from the original on May 8, 2016. Retrieved March 24, 2016. ^ a b Eells, Josh (June 17, 2015). "Emma Stone Talks "Irrational Man", the Sony Hack and Keeping Her Personal Life Private". The Wall Street Journal. Archived from the original on March 16, 2016. Retrieved July 30, 2016. (Subscription required (help)). ^ Riley, Jenelle (July 9, 2015). "Emma Stone, Parker Posey on Woody Allen's "Irrational Man" and Roles for Women". Variety. Archived from the original on August 7, 2016. Retrieved July 30, 2016. ^ Yamato, Jen (September 15, 2010). "Emma Stone's Big Break?". MTV News. Archived from the original on August 9, 2016. Retrieved July 30, 2016. ^ McGee, Ryan (November 13, 2011). "Recap: 'Saturday Night Live' – Emma Stone and Coldplay". HitFix. Archived from the original on March 25, 2016. Retrieved July 30, 2016. ^ Schwartz, Ryan (March 13, 2019). "Kit Harington, Emma Stone to Host SNL in April; Sara Bareilles, BTS to Perform". TVLine. Archived from the original on March 15, 2019. Retrieved March 13, 2019. ^ Flores, Terry (October 8, 2015). "Studio Behind 'Robot Chicken' Breaks New Ground With Crackle's 'SuperMansion'". Variety. Archived from the original on August 18, 2016. Retrieved July 30, 2016. ^ "Emma Stone Heads To '30 Rock'". The Huffington Post. January 10, 2012. Archived from the original on March 3, 2016. Retrieved July 30, 2016. ^ Vena, Jocelyn (May 31, 2012). "Emma Stone to Appear in Final 'iClary' Season". MTV News. Archived from the original on August 9, 2016. Retrieved July 30, 2016. ^ Monde, Chinderah (May 4, 2014). "Andrew Garfield, Emma Stone spoof 'Amazing Spider-Man 2' with awkward make-out sessions on 'Saturday Night Live'". New York Daily News. Archived from the original on April 5, 2016. Retrieved July 30, 2016. ^ Garcia, Patricia (February 16, 2015). "The 13 Best Moments from _Saturday Night Live'_s 40th Anniversary Special". Vogue. Archived from the original on December 1, 2017. Retrieved November 22, 2017. ^ Stedman, Alex (November 22, 2015). "Watch: Jon Hamm, Emma Stone Audition for 'Star Wars: The Force Awakens' on 'SNL'". Variety. Archived from the original on February 25, 2016. Retrieved March 25, 2016. ^ Viruet, Pilot (July 13, 2016). "Maya Rudolph and Emma Stone slang Call Your Girlfriend on Maya & Marty". HitFix. Archived from the original on July 16, 2016. Retrieved July 30, 2016. ^ Rosen, Christopher (October 1, 2017). "Ryan Gosling reunites with La La Land star Emma Stone to remind everyone how they 'saved jazz'". Entertainment Weekly. Archived from the original on December 1, 2017. Retrieved November 22, 2017. ^ Andreeva, Nellie (March 23, 2016). "Netflix Lands Emma Stone, Jonah Hill & Cary Fukunaga Paramount TV/Anonymous Comedy With Series Order". Deadline Hollywood. Archived from the original on August 18, 2017. Retrieved August 17, 2017. ^ Beresford, Trilby (April 11, 2019). "Emma Stone and Cecily Strong Welcome BTS to the 'SNL' Studio". The Hollywood Reporter. Archived from the original on April 17, 2019. Retrieved April 18, 2019. ^ Stasio, Marilyn (December 5, 2014). "Broadway Review: Emma Stone in 'Cabaret'". Variety. Archived from the original on March 5, 2016. Retrieved July 30, 2016. ^ "Discographie Emma Stone". Austrian Charts Portal. Hung Medien. Archived from the original on 19 November 2017. Retrieved 9 September 2017. ^ "Discographie Emma Stone". Belgium (Flanders) Charts Portal. Hung Medien. Archived from the original on 10 September 2017. Retrieved 9 September 2017. For all except noted: "Discographie Emma Stone". French Charts Portal. Hung Medien. Archived from the original on 10 November 2017. Retrieved 9 September 2017. For "Another Day of Sun": "Discographie La La Land Cast". French Charts Portal. Hung Medien. Archived from the original on 10 September 2017. Retrieved 9 September 2017. For all except noted: "Discography Emma Stone: Songs". Spanish Charts Portal. Hung Medien. Archived from the original on 10 September 2017. Retrieved 9 September 2017. For "Another Day of Sun": "Discography La La Land Cast: Songs". Spanish Charts Portal. Hung Medien. Archived from the original on 10 September 2017. Retrieved 9 September 2017. ^ "Discographie Emma Stone". Swiss Charts Portal. Hung Medien. Archived from the original on 15 September 2017. Retrieved 9 September 2017. ^ "Chart History > Ryan Gosling & Emma Stone". Officialcharts.com/. Official Charts Company. Archived from the original on 10 September 2017. Retrieved 9 September 2017. ^ "I Know What Boys Like – Single by Katharine McPhee on Apple Music". iTunes. Archived from the original on December 23, 2016. Retrieved January 4, 2017. ^ Whitty, Stephen (September 17, 2010). "'Easy A' movie review: Emma Stone shines in an otherwise sloppy teen comedy". NJ.com. Archived from the original on December 4, 2015. Retrieved January 16, 2017. ^ a b c d e f "La La Land (Original Motion Picture Soundtrack)". iTunes. Archived from the original on January 11, 2017. Retrieved January 12, 2017. ^ Blistein, Jon (October 8, 2015). "Emma Stone Delivers Madcap Dance in Will Butler's 'Anna'". Rolling Stone. Archived from the original on July 31, 2016. Retrieved August 1, 2016. ^ Jaime, Natalya (October 3, 2018). "Emma Stone to Appear in Paul McCartney's Next Music Video". Rolling Stone. Archived from the original on December 11, 2018. Retrieved December 10, 2018. ^ Horgan, Richard (December 7, 2012). "Xbox Users Set to Play with a Unique Awards Show Component – 'Samuel L. Jackson Mode'". Adweek. Archived from the original on January 28, 2017. Retrieved January 23, 2017.